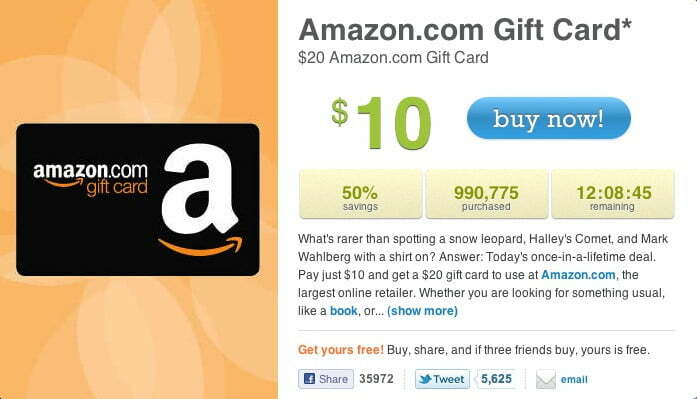 Today and until Thursday morning at 8am ET, LivingSocial is offering a $20 Amazon.com gift card for $10. This deal comes on the heels of Amazon investing $175 million in the startup just over a month ago. As of 5pm PT, nearly 1 million Amazon.com gift cards have been purchased through LivingSocial, netting nearly $10 million in gross sales for the startup. LivingSocial is expected to receive a 30% commission on the deal, leaving Amazon at a significant loss. Seems like an odd decision for the online retail giant, doesn’t it? That’s until you realize that as an investor, this is really nothing more than a publicity stunt which will garner thousands of new subscribers to LivingSocial who will then begin receiving regularly scheduled local deals. Pretty crafty, huh? The competition on coupon sites is fierce, with Groupon and LivingSocial leading the pack of clones, so it’s no surprise that these sites will do whatever they can to garner new subscribers. Groupon recently raised $950 million in private equity financing. That’s after Groupon turned down a $6 billion takeover from Google. Groupon’s value has also gone through the roof, with recent estimates valuing the company at $15 billion.